Info "Some people will tell you that grabbing is rude. Ignore 'em! In fact, touch this falling stick to grab it!" Up for Grabs is a microgame found in the Touch Training stage in WarioWare: Touched! The objective of the game is to tap any part of the object as it falls to the lower screen to catch it. 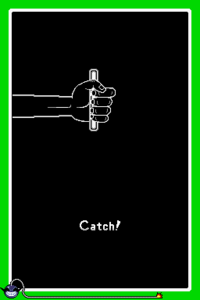 If the player catches the object, they win, but if the player does not catch the object, they lose. 1st level difficulty: The object is a bar. 2nd level difficulty: The object is shorter and bent. 3rd level difficulty: The object is a very short bar. Also, the bar is broken and the hand is moving from side to side. This page was last edited on December 19, 2018, at 01:09.